In October we were lucky to have the opportunity to acquire another bird for our Shorebird Exhibit, a juvenile common tern. Common terns are smaller and more delicate than their relatives the seagulls. They are graceful fliers and you may have seen them at the beach, hovering in the air before plunging into the ocean to catch small fish. They breed in Canada and the Northern US and migrate to the coast of South America in the winter. Despite their name, common terns have experienced large declines in their population. They were hunted for their feathers in the late 19th century and were harmed by pesticide use in the 1970’s. Today they continue to be threatened by coastal development. 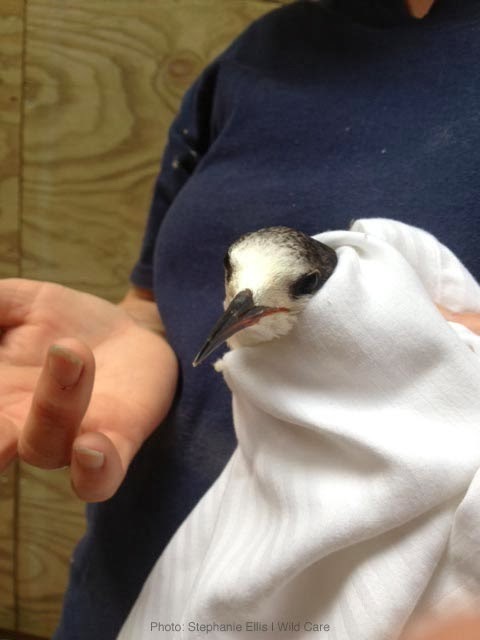 This tern was discovered emaciated and unable to fly on a beach near Orleans, MA, on Cape Cod in late August. She was brought to Wild Care where the rehabbers discovered that her right wing was injured. She had no fractures that were detectable from radiographs, so the injury was likely due to a torn tendon or ligament. The tern lived in an aviary through September and into October while her care-takers waited to see whether her wing injury would heal so that she could be released to migrate south with other terns in October. It became clear that the bird would not be able to fly well enough to be able to fish or migrate. New England Aquarium staff picked her up in late October, just in time before some cold weather set in! 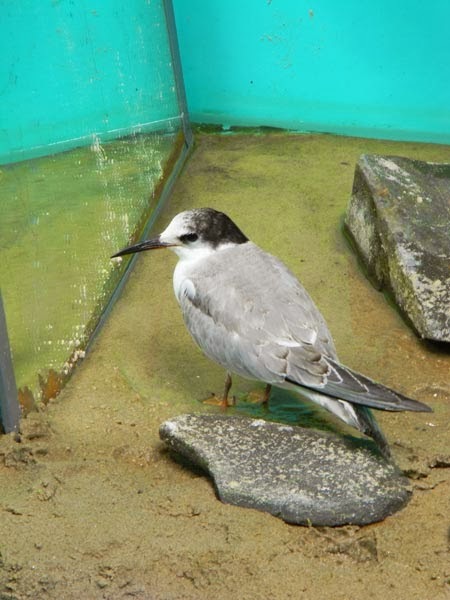 The tern went into quarantine in an indoor enclosure. We were pleasantly surprised by how calm she was around people. She would squawk loudly in the morning to remind us that it was time to be fed her first fish of the day! 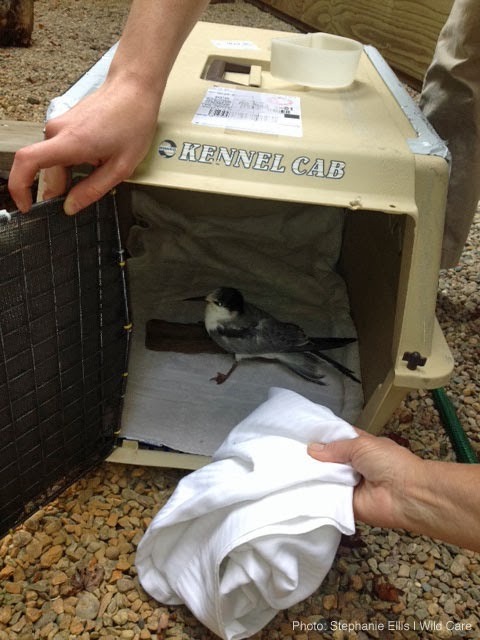 Our new common tern came to us from the same wildlife rehabilitation facility, Wild Care, as our semipalmated sandpiper. The exchange of these birds was mutually beneficial—Wild Care found a good home for two non-releasable birds and the Aquarium now has two great new exhibit animals that will help educate the public about shorebirds and their conservation. Stay posted for an upcoming blog about the tern’s introduction in the exhibit.